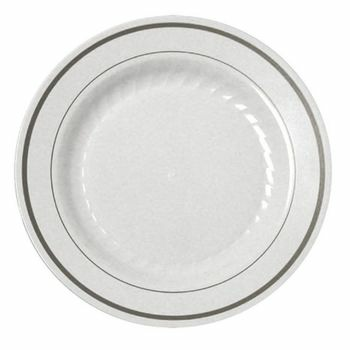 Silver Splendor 10 1/4" White Dinner Plastic Plates w/ Silver Band 12ct. Silver Splendor 9" White Luncheon Plastic Plates w/ Silver Band 12ct. Silver Splendor 7" White Salad Plastic Plates w/ Silver Band 15ct. Silver Splendor 6" White Dessert / Cakes Plastic Plates w/ Silver Band 15ct. Silver Splendor 12oz. White Plastic Bowls w/ Silver Band 15ct. Mozaik 14" White Plastic Sqaure Platters 2ct. Mozaik White Rectangle Plastic Platters 6" x 17" 2ct. Mozaik 13.5" White Plastic Round Platters 2ct.